Bramley Lodge has 3 Bedrooms one of which is en-suite with slipper bath + 1 bathroom which has a wet floor system with toilet hand basin and 2 showers (at least 1 with disabled facilities). There is a large living area which is centrally heated by an underfloor oil fired heating system but also has a large wood-burner for the long cold winters nights! The cabin is complete with a full range of electrical appliances, washing machine, tumble dryer, dishwasher, Fridge and freezer, Large 1000mm cooker with 8 gas burners and 2 ovens, microwave, solid pine kitchen with granite tops TV, DVD and video. Each Bedroom has its own combi TV/DVD or TV/video so there's no need for arguments as to who watches what programme at the same time. The beds are Victorian Iron bedstead style like the ones in the bed and breakfast and have sprung beech slats and are topped with pocket sprung mattresses. It is set in it's own grounds and has a large private patio, hot tub and garden and is set amongst an orchard full of mixed fruit trees. The cabin will also be available with a degree of catering if required. 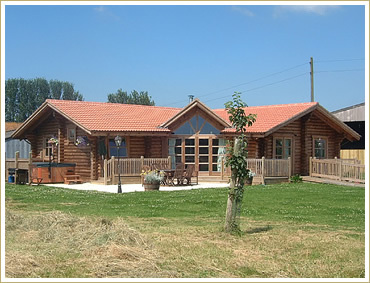 Why not treat yourself to a week in Somerset in the ultimate Log Cabin experience in 5 Star Luxury Self Catering - you deserve it!